It’s been a long wait, but Tengami ($3.99), the adventure game inspired by pop-up storybooks, has finally been completed. The developer, Nyamyam, is a new name, but you’re almost certainly familiar with past projects they’ve worked on, including Diddy Kong Racing, StarFox Adventures, Way of the Samurai 3, and Kinect Sports. 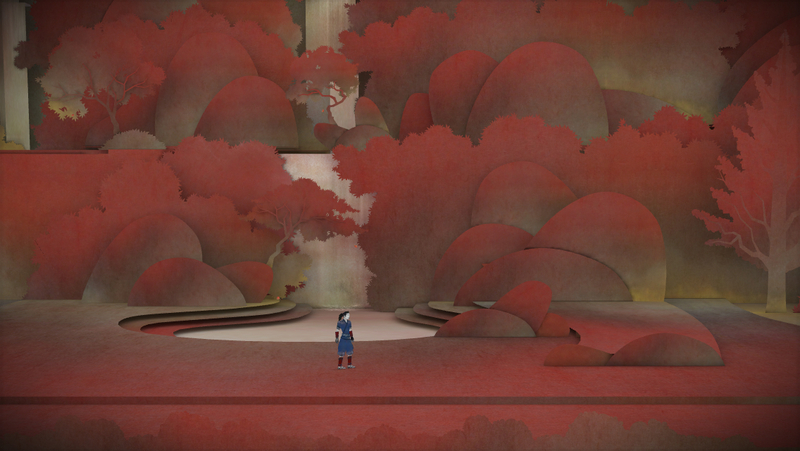 Tengami got a lot of attention almost immediately, thanks to its eye-catching, beautiful graphical style. The final product delivers on that visual promise and then some. It was less certain was how the gameplay would turn out. Happily, I can say that while the gameplay is considerably more pedestrian than the presentation, it’s solid enough that fans of adventure and puzzle games will definitely want to give the game a go. 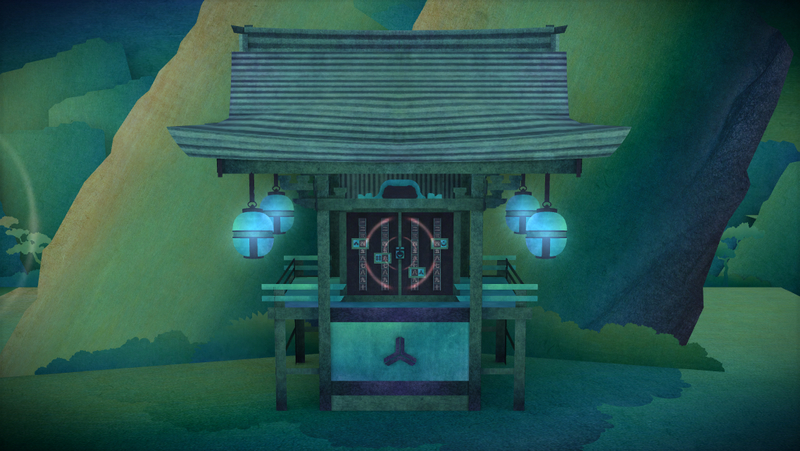 Tengami takes you on a journey through a Japanese pop-up book. You’ll travel through four different areas, trying to return life to a dying cherry tree by retrieving a cherry blossom from each location. You’ll visit a few abandoned shrines, travel the seas, and experience the changing seasons. The game is essentially a point and click adventure game, with most of the puzzles making use of the game’s main gimmick of turning or folding paper to change the environment. It’s not a terribly long game, and if you don’t get snagged for too long on any of the puzzles, you’ll probably have it wrapped in under a couple of hours, but the brevity kind of works for Tengami. First of all, I’m going to gush about the presentation, because wow, this game is something else. It looks nice in stills, but once you’re playing and can fool around with the folding and turning yourself, you can really appreciate the complexity of the visual design. I’ve played some games before with a mechanic based around folding paper to manipulate the game space, such as the Paper Mario games, but none of them have actually tried to present the process as authentically as Tengami does. When you’re flipping scenes, you can actually see all the little pieces folding and interacting, something that must have been painstaking to recreate. The payoff is worth it though, because the various set pieces all seem to have depth well beyond the actual play area. I’d be remiss if I didn’t mention the music, as well. Done by David Wise, who is probably best known for composing the music found in Donkey Kong Country and Battletoads, it manages to sound nothing like any of his prior work and yet still beautiful and a bit haunting all the same. It feels very true to the overall theme of Japanese fairy tales and helps contribute to the feeling of serenity and other-worldliness the game drapes itself in. The sound effects are sparse, but do their job as well. This wonderful package of sights and sounds is what elevates Tengami above the average adventure game. It has a unique style and it completely owns it. The gameplay is a bit less bold, unfortunately. You move around the environments by double-tapping and can occasionally interact with objects by tapping or swiping. Almost all of the puzzles use the paper flipping or folding in some way. Sometimes you’ll need to flip panels to make yourself a path. Other types of puzzles have you seeking out clues by carefully turning pages to spot hidden symbols or numbers. At other times, you’ll have to flip over a part of the page to move objects in the direction of others. There are some traditional types of puzzles mixed in, as well, such as finding and replacing missing pieces to machines or entering in the correct series of objects to unlock a door. The puzzles are essentially the game, making this a fairly laidback quest you can really engross yourself in. There’s quite a variety of puzzles in the game, though very few actually require much beyond being a good observer of your surroundings. The folding mechanic is used fairly well, and the short length of the game helps keep any of the puzzles from overstaying their welcome. Of course, once you’re finished the game, there isn’t really any reason to replay it beyond experiencing the atmosphere again. There are Game Center achievements, a whopping four of them, all of them tied to progressing in the game, so you won’t find any extra things to do that way. What you’re really buying into with Tengami is the experience, and I think that’s a divisive hook to hang one’s hat on. I think the presentation alone is worth the price of admission, and I had a really nice time digging into Tengami for the short time it lasted. Like the blooming of the cherry blossoms in the spring, it’s a beautiful joy that passes perhaps a bit too quickly. As long as you’re aware of that aspect going in, I think you’ll enjoy what Tengami has to offer. There are other adventure games on the App Store that offer more replay value, a longer play time, and more choices, but I’m not sure if any of them are quite as striking as this one. Backed with some solid gameplay, I think Tengami more than proves itself worthy of a place in the adventure fan’s library.